Increase satisfaction and ease of use when interacting with a refrigerator. Basically, we need to improve the design and functionalities of the refrigerator to make it more user-friendly, easy to use and feature rich to satisfy our customers. To achieve this goal, we have to hear what our customers and stakeholders are looking for in a good solution. Surveys conducted are anonymous, only type of user (home, working, etc.) is askedOur scope is limited to the interaction with the refrigerator; very less or no consideration is given to the environment in which refrigerator is being used.Survey and Interview sample size is 20-25 peoples having different level of interactions and use cases with the refrigerator. We assumed this sample size is enough for our scope.We are assuming that we are doing all these exercises to improve a business position in the market. The main pain areas resulting from user interviews, contextual observations, surveys with the refrigerator use are: The refrigerator is not modular and doesn’t suit the containers if they are very large or small.Very painful to every time open the door just to see what is there inside and control the temperature.Very difficult to move from one place to other to clean it or floor under it.Almost all the participants wanted some indication in a display like temperature, capacity, odor level etc. The other interesting finding is that customers like their brands with their heart and would not like to switch to different brand if purchasing a new refrigerator but can reconsider their decision if reliability in the form of warranty is provided. Increase satisfaction and ease of use when interacting with a refrigerator. The objectives are to observe, interact with the users and prospective buyers to know their needs and understand their feelings when they use a refrigerator. Basically, what they see as limitations in their usage and what things they desire when buying a new refrigerator will be good opportunities to increase the ease of use and satisfy users. To lead in the competition you need to hear and understand the voice of customers, potential buyers, and all the stakeholders and adapting the product/business strategies accordingly. The current problem belongs to the refrigerator market segment and the problem is how we can satisfy variety of users by delivering better quality and feature rich refrigerator meeting their needs. For solving this problem, we needed to collect, process the data of how different types of users use a refrigerator and what features they see in a refrigerator that they will surely buy if one such refrigerator comes to the market. We will discuss below how we came to the same frame and thinking level in which the users were thinking and what recommendations we proposed to achieve the desired problem objective. We will walk you through the process that we followed from connecting with the users, getting their needs to build the solutions. Overview of the process is given below; detailed steps will be explained in sufficient depth in this section after the overview. Finding improvement areas and recommendations. Let’s discuss these process steps one by one in context of how we performed them and what artifacts we collected and analyzed at every step. The main purpose of this exercise was to understand the problem and its context. We have discussed this part in the start of Section 2. We planned what exactly we need to do next and what different steps we have to follow to reach till the solutions. We discussed in the team that we need to interact with the users in best possible ways. To achieve this objective we defined our goals and scope under which we will be interacting with the end users and the stake holders. We planned to do the team work till the data consolidations and after that solutions/prototypes will be done individually. This planning resulted in steps from 2.3 to 2.10 below. We defined the goals and scope of our tasks which will guide and keep us on track in the data collection process and user observations. For example: making ice, water cooling, protecting perishable food items, storing milk, meat, etc. For example: faster cooling, uniform temperature at around all the corners, odor detection and control, capacity indicator, rotten item indicator, etc. For example: exteriors and interiors, mobility, accessing door, modular design, noiseless operation etc. We used the following user observation methods explained with the reasons. It can be done in person or over the phone. It is one of the best techniques because you directly interact with a user and can interject questions in a dynamic environment. To understand things from the point of view of users and making them feel comfortable that we are there to help them and solve their problems. You can see them using or working with the refrigerators and observe their particular way of doing some things and can interject your questions. Facebook polls for getting problems from variety of the users. We received ~10 survey results by using this method. (Refer Point 4 in Section 2 of Design Study Summary). You get the feel of behavior/dynamic flow of refrigerator and usage workflow. You can point to a particular problem or improvement area. Photos are also useful to give the feel of environment and layout. To collect the pre observation data with some interacting group. We three participant did the discussion among ourselves on initial set of questions and basic understanding of the context. In this step, we identified key contact persons who we will be contacting for the observation and did some pre research about our users to prepare some personas. 2.5.1 Usage/Functionality types of a refrigerator. Q1: What are your different uses of a refrigerator like ice making, water cooling etc.? Q2. Can you briefly tell us your one day cycle of interaction with the refrigerator from Morning till sleep? You can only describe the things related to the use of refrigerator, no personal data is required. Q3. Do you see any limitation in its usage like speed of cooling, hard to use and cleaning? Q4. 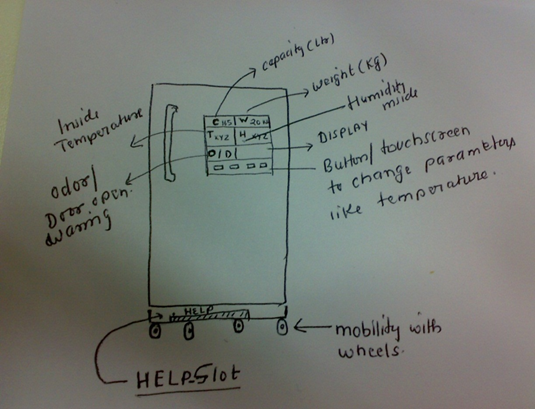 Do you want to suggest new improvement or idea that can make refrigerator easy to use for you or other people? Q5. Are you content with temperature control or will you like to see some changes in the mechanism? Q6. Do you like the food placed in the refrigerator to eat? Q7. Have you faced any problem or limitation when you were demanding something from the refrigerator and it was not able to deliver? Q8. Have you seen such problems with other peoples? Q9. Do you want to have some kind of signals for refrigerator like when it is opened, tone will alert you? Q.10 Have you faced any problem related to odor or fungus in your refrigerator? Q1. Do you like the design of your refrigerator? Q2. What do you like in your refrigerator design? Q3. What changes you want to see in the exteriors and interiors of the refrigerator to improve it? Q4. Any limitation you felt by the design? Q5. Do you need to move your refrigerator from one place to another, if yes, can you move it easily? Q6. Are you able to fit the containers you have in this refrigerator or you needing more space? Q7. Do you think that we should manufacture refrigerator with green technology? Q8. Are you aware about the design/different parts of your refrigerator? Q1. Do you think that you refrigerator is energy efficient? Q2. It is related to Q1. If not, why you think so? Q3. Do you have any idea in how we can make it more efficient? Q1. Get filled the user profile survey sheet from users. Q2. Did you face any danger possibility when children are near refrigerator? Q3. Do you need extra warranty at some extra nominal cost? Q4. Do you have emotional attachment with your refrigerator, if yes then why? During this period, we observed and interacted with the users based on our goals, questionnaire, and assumptions. We followed the observation methods (see section 2.4) as agreed upon. We got the surveys filled, had interviews with the users, took photo/video shoots of usage and environment for the data. We planned to meet after the data collection at a pre-determined time and place. The user problems and stories are given in Appendix B. After we collected the data, we assembled at the place of meeting and briefed each of us about the tasks each of us performed. We wrote everything on the paper notes and pasted them on the board. We also captured the users observed for later consolidation along with “Let Go” solution provided by the users or us during the observation period. “Let Go” solutions are basically the solution that comes to your mind intuitively on the spot. We followed three steps process for the debriefing. Each person will explain what he has collected and put it on the board in the proper identifiable and readable manner. Now we as a group went to the board to find the similar improvement areas and user roles and consolidated them. Everybody assigned priorities to the consolidated items along with few key users. We did the work of note taking, moderation and work modeling in this step. After the debrief session and brainstorming, we formed the categories of the problem areas or improvements area. 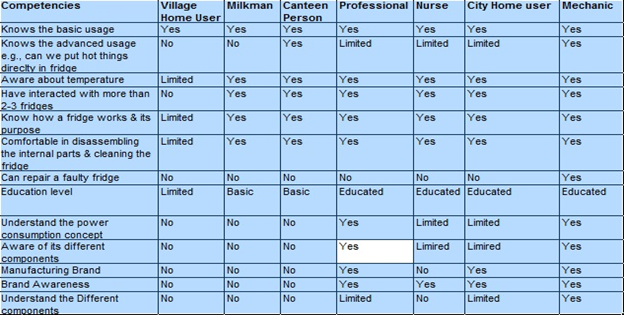 We also consolidated user roles (refer to Appendix A) and prepared user profiles (Refer Table 1). Before going for the recommendation for the problems or key finding, let’s us have some actual refrigerator photos where the problems are reported. Figure 4 clearly shows that compressor and wires are exposed outside. Compressor is very hot, and exposed wires if cut can increase the danger of electrocution. We will need to solve this problem for safety point of view. Some shield could have provided on the back side of the refrigerator. As you can see in the Figure 5 below lock is provided to safeguard against small kids. This lock is a simple mechanical lock with keys, and consumes time to lock and finding keys. This could have been a button to toggle lock and unlock. Figure 6 clearly shows a violation in proper labeling of the circuits and components of a refrigerator. This component pointed in the figure can be a dangerous thing if unknowingly touched or overlooked (Well, I don’t know, no label is there). Figure 7 shows an example of the mobility problem when the refrigerator is placed in the corner and we can’t open its door fully to pull out a container outside or when somebody wants to clean the refrigerator inside. This mobility limitation comes in the way again when you want to displace the refrigerator. We used the conjoint analysis for the evaluating the recommendations. Check the result section of Design Study Summary or Discussion section 3.5 for the recommendation we proposed. For detailed recommendation, please refer to Appendix D.
At the end, we brainstormed and discussed among ourselves and with the users to propose solutions in terms of mock ups or prototypes. Some of the promising recommendations are given in section 3.6 for which mock ups and sketches are made. For all the recommendations you can refer to Appendix D.
The following acronyms and abbreviations are used throughout this document and are defined here for convenience. We have covered the problem and its background in sufficient depth and breadth in the Analysis section. Please refer to section 2 or Design Study Summary for more information about problem and its context. We will see some more insights into the process we followed from planning to data collection to how we arrived at the solutions. We will also go through how we captured the data and observed the users. We will discuss in details the mock ups for the recommendations that we have proposed and some alternative ways of doing those recommendations. We are also going to evaluate our assumptions and their effects on our recommendations and mock ups. We will also evaluate our mock ups for their pros and cons. Let’s us first star with the observation methods we decided. We identified the key contacts that we will be communicating with and at what specified time. We focused more on contextual observation because it provides you the context and working condition of the user in its environment and then you can make yourself aware of the workflow he is following and how he is interacting with the refrigerator. By getting this information, you can better observe the user and can find inefficiencies (opportunity areas) in the workflow or usage. 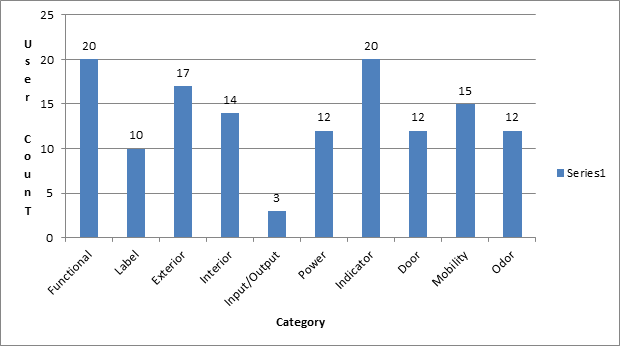 We received lots of data regarding the modularity when we were seeing the participants performing their tasks and not using particular areas for a long time, we interjected on the spot questions that why it is happening, that gave us more insight for data collection at lower level details. We had to struggle a bit for getting surveys because people were avoiding them. But after we convinced them that it is totally anonymous and no personal information will be recorded, we got few key inputs from survey participants. Sample Size: Our Sample size is around 20-25, we have included people ranging from villages to cities, from young to old generation, both genders, novice (villager) and experts (mechanic), persons from different profession. Though the sample set is small but it is diverse and we got similar kind of responses from similar user profiles. If this assumption of diversity and reasonable sample size is not met then the data outcome can be biased in one or two areas, which can affect the recommendations we will give and it can be deviated from the voice of most of the customers. Anonymous Surveys: We conducted survey anonymously, just asked them what kind of user they are. We didn’t need any personal data to seek what is the voice of our customers. These kinds of surveys work when people want to participate and contribute ideas but don’t want to come outside in front seat. If this assumption is not met, then user may feel tracked with their personal information and psychologically they may not feel comfortable and may not give their full capacity data due to the mentioned reasons. If this happen, we can only get very few samples and those can’t be treated valuable as the participation is not free to think and act. Refrigerator Environment: We have limited our scope with only the interaction and usage with the refrigerator. We have done very less research on the environment and workflow around the refrigerator. We have analyzed that these kind of special conditions and environment use cases are few ones. But if this assumption is not met, we may observe some voids in the data related to environment and workflows. Though we have captured some environments like Canteen Kitchen, Home kitchens, but the study was not extensive. During debrief we assembled at a place of choice and time that we already agreed upon in planning. This session started with every one writing their key findings on the different color notes and posting it on the white board. It was a very interactive session, where each person was talking about some of the interesting things he found during the observation, while posting the notes. After the debrief session, on the same day, we collated the data and prioritized it to focus on the important findings of the user research. After all the arguments and counter arguments by each team member, we jolted down the key recommendations. But before we discuss the recommendations, I would like to walk you through what user were saying about the findings during interviews, surveys. Please refer to Figure 12 for the visual representation of user responses for each category. More functionality in their refrigerator, modular design, they want everything fast and automated about their refrigerator. Some kind of visual or sound indication of refrigerator functioning and running status. Exterior is also on users’ priority list because they want to see and control everything about the refrigerator without the door every time. Users were also having problems with mobility to easily move and clean the refrigerator. Users also wanted some solutions to cope with odor (rotten food items, taste). We got the top recommendations as discussed in section 3.5. I am going to explain in depth the solutions brainstormed and generated with mockups and drawings. For making refrigerator more modular and adaptable is to make adjustable horizontal and vertical dividers so you can get the flexible space for variety of containers. 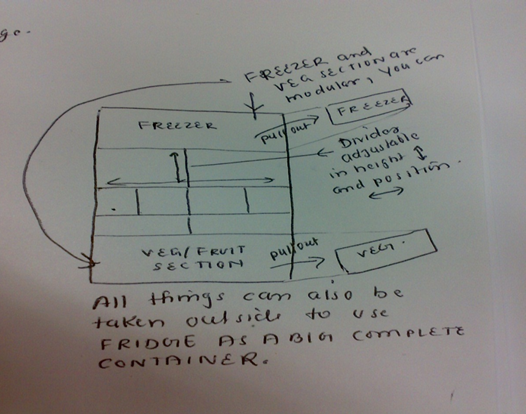 Along with this, provision of modular freezer and vegetables sections can be provided. Freezer can be pulled out from the top and can be placed at the bottom and veg section can be placed on the top based on the season (winter or summer) or as per the usage patterns. There can be a provision of some button in/control outside the freezer section to convert it into veg section and vice versa. Provision of dividing the main door into numbers of smaller doors can be provided, so to reach to a particular section of the refrigerator, you need not to open the complete big door. Figure 9 explains the points visually. By providing the transparent doors and side walls for the home use can greatly increase the ease of use and satisfaction of the buyers because they need not to open the refrigerator every time just to check if something is placed inside; they can check the things from outside to better plan. This concept is being used in super markets but not penetrated homes yet. Although solution may not sound aesthetic as it exposes all your things placed in the refrigerator to the outsiders in your home. The solution for that can be providing some control outside to change the transparency of door back to opaque and vice versa. Check the Figure below to get the feel how it will look if implemented. Figure 11 explains all these needs. Wheels are provided for better mobility. Wheels can be provided with the locks to fix the wheels in one place and stopping them from unintentional motion. For better controlling refrigerator and knowing its status, some kind of digital LCD/LED display can be provided outside the door. That will make the tasks easy of controlling temperature (with options of oC or oF), humidity from outside without opening the refrigerator. Along with the controls, this display will also show the information about refrigerator like its capacity (e.g. 200 Ltr), current temperature inside refrigerator, odor level or other kind of visual warnings. Alternate approach for the “outside display” can be a remote control with inbuilt display. This remote can control the refrigerator settings and shows its different properties like current temperature, humidity, odor level, etc. User help can also be displayed on the display for easy accessibility. If a hard copy of the help is to be provided, a help slot can be provided to keep the help book or some other related document at a handy place. Help can include the topics for example best practices of how to use a refrigerator efficiently, what kind of things can be put inside the refrigerator and at what temperature, etc. “Output ports” is an innovative feature as shown in Figure 12 below. Output port means that we provide some sort of output to external containers to cool their contents. It means you are extending your refrigerator using these output ports through a connecting pipe. Along with this, disposable fiber glass can be used for building the non-electrical parts of the refrigerator because this material is lighter than traditional material, less brittle, flexible and also doesn’t hurt the environment. This adaptation can ease the movement of the refrigerator. Figure 12 – Mock up for output cooling ports to cool outside containers. RM, PC, etc. are short code words that are mapped to our users and we have adopted this convention to keep their anonymity. Many users of similar requirements are clubbed under appropriate roles and are not shown for brevity. A professional this person have some good knowledge about the refrigerator. She is aware of the brands leading in the segment. Brand awareness is there but logical decision is made if need to choose another refrigerator. As a home user, the interaction with the refrigerator is enormous for keeping milk, foods, water, ice, vegetables, etc. She knows the basics about the refrigerator and its working. Aware of the different brands and like his/her brands very closely. As a village home user they are comfortable in basic usage. They just need refrigerator to do their basic things like food, water, milk, etc. Not aware of brands much. Cost is important to buy a refrigerator over all other benefits. As a canteen person, they heavily use their refrigerator and know what to put in and how to control its setting easily. As a nurse and doctor profession, she has the basic knowledge to use it and clean it. She is well educated. The mechanic understands all the aspects of a refrigerator and is well educated/trained to repair/use the refrigerator. In the round brackets, we have given code names of some of the users that we interviewed. The list is comprehensive and not full to maintain the clarity. 13. 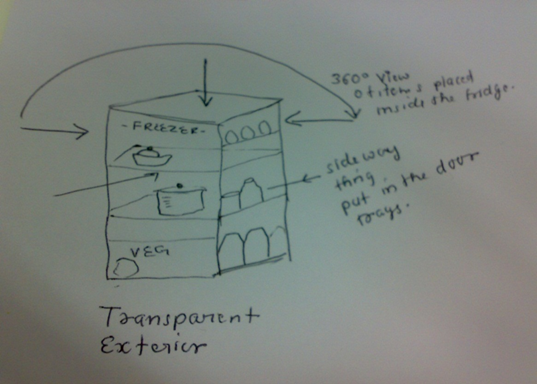 (SM) instead of vertical heighted refrigerator, horizontal refrigerator model can be used in homes to get more visibility of the items. It can take more space horizontally which is scarce in big cities. This model can be helpful in smaller cities and villages. 1. (JK) indicators for temperature, total capacity and available capacity so that i need not open the doors every time. 2. (PC) Temperature control arrow is confusing, sometime i found it which direction to Increase and which to decrease. 1. (RM) refrigerator should have different doors for different compartment instead of main door. 2. (MT) door closing should be slow as it is noisy and unbalancing the things placed inside. 3. (AN) when pushing doors, things get imbalanced. 4. (MT) there is not alarm when door remains open, should be a provision of alarming. 5. (AN) can’t open door if it is near the wall, some way should be there to get the things out. 1. (CM) Wheels to move refrigerator so that while cleaning the floor and cleaning the refrigerator i can move it easily. 2. (RM) Refrigerator should be mobile but should be steady when not moving. 4. (MT) Separate take way box that i can put and take when going outside. 5. (MT) height adjustable wheel base. 1. (RM) separate compartment for the items having odors. 2. (CM) Detection of rotten items. 3. (CM) automatic indication for bad odor such as beep. 4. (CM) Smell of one item should not be mixed with other items. I have encountered this problem many times where one food smell is coming from other eatable. 5. (CM) Food taste doesn’t seem fresh; it is like we are eating some stale food. Problems or improvements in usage or design during the use of refrigerator faced by you can be shared. Please provide the reason also for your improvement areas in the refrigerator design and functionality. 1. Section of vegetables should be spacious to put more vegetables. 2. Refrigerator door handle is not at a right place. 3. Power consumption is high. 4. Should be fungus proof because i have seen black fungus type inside refrigerator and it may spoil food. Temperature controller panel is deep inside the refrigerator. No light in Ice Cooling part. Cooling should change as changes in weather. It remains fixed irrespective of outside temperature. Door side cooling should be good. Freezer is not working properly. Regulator is not working properly. Auto temperature control according to weather should be provided. Different temperature control for different climate should be there. Need wheels which will help to relocate. Need indication if refrigerator going in bad state e.g., status of compressor. Problem faces by user while keeping Birthday cakes. Problem faces by user keeping the 1.5 liter cold drink bottles. Doors slides down due to weight. Some types of refrigerator make much noise. Old refrigerators are not disposed-off in correct way. These contain some hazardous gases and materials that should be disposed correctly. There should be separate temperature control for normal section and freezer. For some types of refrigerators, back panel becomes very hot which is not good. Refrigerators should work\keep inside goods in better condition even when power supply is cut off. This will help in the areas\cities where there is frequent power cutoff. It should have moving wheels. Tray for collecting water should be big enough- If there are different doors for separate compartments, these doors should be see through, transparent so that i know which stuff is where. Back design is not that good. Improvement: Remote Control that can open the door. Not good use of space inside it. Not much resistant to electrical fluctuations. Door should be transparent to see the things without opening the door. Some of the proposed solutions are given below. 1. This is the problem, we have never seen a single refrigerator labeling all the important parts or connections or circuits. 2. Help guide for how to use a refrigerator and its best practices of setting temperature and putting things inside and how, it can be put in a side slot in the refrigerator that can be easily accessible. 3. If refrigerator has good large display outside, help guide can be also be provided electronically. 4. Remote control to open the door or control the temperature or other settings. 1. Transparent doors and walls check the diagram. Can be easily provided but we need to see the aesthetic effects after that. If we can also provide some way/button to switch between transparent and opaque walls, then it can be a great ease of use and interaction. Otherwise, we can have camera installed internally that can display the inside story outside on display. 1. Modular design, check the diagram. 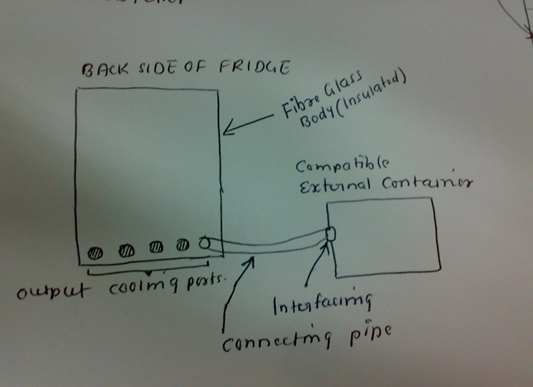 Refrigerator can be provided with ports (like an usb ports) where you can connect compatible pipes to cool container outside the refrigerator. This can extend the refrigerator capacity. But there can be some limitation like to prevent leaking pipes or containers. Some mechanism should be present there to detect these kinds of leaks. It is looking promising but we need to observe the ROI on its research by conducting more exhaustive surveys and VOCs. 2. If refrigerator is empty then it should be auto switched off or reduce the energy consumption if the cooling is needed only in specific part or compartment inside the refrigerator. Can be done easily by using sensors firing after a certain interval frequency to check the refrigerator is empty or not. 3. For the display or light inside we can use, high efficient LEDs, LEDs consume power of 1/10 of the bulb used inside the refrigerator and provide better light output with less heat dissipation. 4. Electric fluctuation can be avoided by built in stabilizers, many makers have model that have this feature. 1. Can be easily implemented, refer the diagram. 1. Door should be slowed down when it is pushed hard either by mistake or by a child, so not to imbalance the things, liquids placed inside it. It can be easily done using the latest motion suppression and vibration reduction technologies. Mobility can easily be done with balancing and sturdy wheels that can handle some vibration due to the compressor and motor running. Locks can be provided to wheels to lock their motion once the refrigerator is installed in the environment. Customers prefer the brand mobility solution as they believe them to be of equal quality as the refrigerator is. They don’t want to go to the local vendor. Odor can be handled by placing a sensor detecting some gases that are released from the rotten things. Beep warning can be provided to the user along with flashing visual signal on outer refrigerator display. Electronic nose that detects like nose gases like sulphide, ammonia, carbon monoxide, etc. can be used to detect odor and integrated with microcontroller logic to send signals for warning (visually and sound). Food taste can be improved with the air flow regulation/restriction inside the refrigerator. Suggesting the customer best practices to avoid this situation is a good viable option. 2. If some vegetable/fruit/meat is cut, please wrap in a thin plastic or put in a special container inside the refrigerator for that purpose. 3. We can control the temperature inside the refrigerator doesn’t rises too fast or too slow so that you can get your expected temperature setting whenever you want food. This can easily be achieved by improving the design of the compressor to achieve high cooling velocity. Speed up the cooling gas liquidation and vaporization using the latest.